In this tutorial we we learn basics of Writing a wordpress plugin. A WordPress plugin is a PHP file with a WordPress plugin header comment. It’s highly recommended that you create a directory to hold your plugin so that all of your plugin’s files are neatly organised in one place. 1.First you will need to install WordPress, you can follow wordpress installation tutorial here. 2.After wordpress installation. Goto to the WordPress installation’s wp-content directory. 4.Create a new directory and name it after the plugin (e.g. plugin-name). 5.Create a new PHP file (it’s also good to name this file after your plugin, e.g. plugin-name.php). 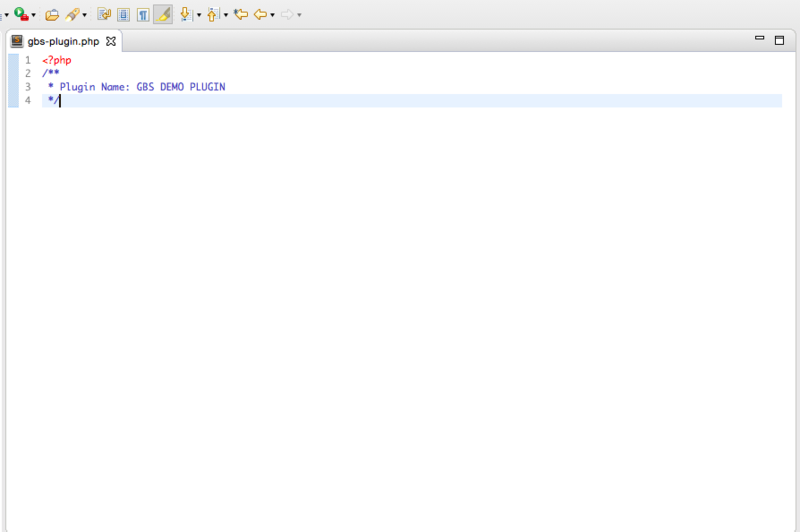 6.Open the File to Edit and write this code in header and save the File. 7.Now goto Plugins form left menu. This screen will list number of plugins installed. find "GBS DEMO PLUGIN" and activate. 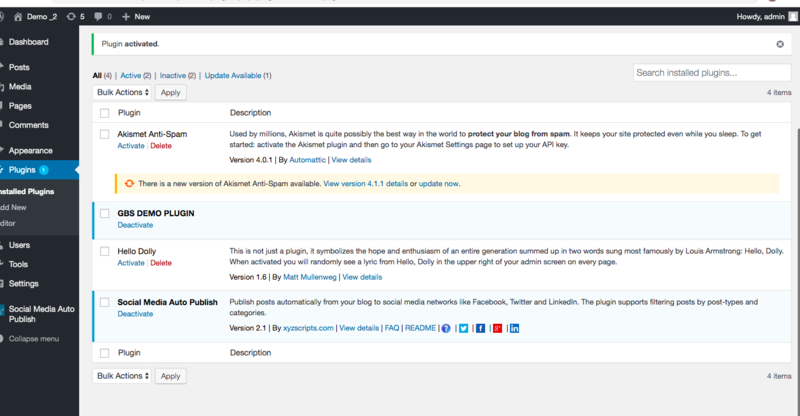 Functions used to modify Actions/Filters in WordPress can be hooked into WordPress. However, it is important to note that actions and filters are not the same thing. Now we will discuss and differentiate in detail WordPress Actions and filters. Filters are functions that WordPress uses to pass data through. Passing data through filters allows developers to modify the default behavior of a specific function. Functions used to filter data are called hooks. Filters and Actions together allow developers great flexibility to modify default WordPress filters and actions and even create their own custom filters and actions so that other developers can extend their plugins or themes. Filters are different than Actions. WordPress actions are executed at events like when a theme or plugin is activated, or when a post is published. Filters are used to filter output when it is sent to either database or to user browser. The sample code above adds a function wpb_custom_excerpt to the filter get_the_excerpt. o give you an example of how they can be used to add code to a website let us assume that you want to add a copyright notice to your footer. In order to do this you could modify your footer template directly. In some cases this would be preferable but many times it is much easier, and better practice, to hook your code to a predefined action that is already being executed in the footer. To do this you can add your copyright code into a function in your functions.php file. You can then add this function to an action that is in the spot where you would like your copyright code to be executed. When I needed to implement some functionality on model saving, I always asked a question to myself – where to place it. In signal or in model method save()? Let’s see, what and when is more applicable. When use model methods save(), delete()? To my mind class methods are more usable, if logic concerns exclusively current model. For example, fill some field on model saving according to data from other fields. Some people say, that signals are better because it is easy to reuse them. It seems strange to me because we can define a function or a mixin class and reuse it in method save() as well. Generally, we can always use signals, so why I favor method save? Simple answer – it is more readable. When you are going through the model, you can easily understand, that something will happen on saving. In case of signals, especially if there is no rule where they are defined, the logic often come out of sight. Keep in mind, that delete signals pre_delete, post_delete have some advantage over delete() method: they are called even on cascading delete and deleting a queryset. This is not happening with model method. In this situation make a decision according to context, maybe cascading delete is not so important. On bulk creating and updating no code is executed: nor signal nor save(). So here they are equal. And don’t forget to call parent’s method save() or delete() if you override them. Signals are more applicable when you implement reusable applications. The users of your app can easily connect signals to their models without modifying the code of these models. We can define a function or a mixin class for the same purpose. But agree, that attaching logic from some foreign app is more comfortable by using signals. Besides, if you decide to stop using the app, you will need to modify very small part of the project’s code. The same is true when there are two (or more) apps within one project and you need to do something with one model when another model from the different application is being saved. Imagine two applications, users and reports. When we create a user we need to create automatically a report for that user. In this case, I prefer to create a signal in reports application, since logic corresponds to it. Firstly, we keep logic in the place where it belongs. Secondly, if for some reason we decide to delete the reports app entirely, we don’t even touch the users application. Where define signals and were connect them? As django docs (section “Where should this code live?”) suggests, define signals in separate submodule signals and not in models.py and __init__.py. This will save you from import problems. To be sure the signals are connected, we need to execute the code that connects them on project launch. When we define them in models.py, we already get this. But now they are living in other place and it won’t run until we import it somewhere. Let’s do it in ready() method of application config class. In general, I follow recommendations from this stackoverflow answer. Here is an example for users and reports applications, that I talked about earlier. We need to create a report on user creation. And now our signal is connected. In this example I used decorator @receiver, so just import is enough. We also could call connect method of the signal explicitly here. It is a matter of taste. If follow these rules we will always know where to find signal handlers. And consequently no need to search the models module to find them. Django application makes several similar queries like ‘SELECT COUNT(*) ……’.As it turns out queryset.count() has not obvious cache. Let’s discuss in detail from the very beginning. New JSONField will be added in Django 1.9, it can be used with PostgreSQL >= 9.4. Let’s try to work with it and find out, in what situations it can be useful. In this Article you will learn about basics of python Dictionaries. In this article You’ll cover the important characteristics of lists and tuples.You’ll learn how to define them and how to manipulate them. When you’re finished, you should have a good feel for when and how to use these object types in a Python program. In this article we will discuss the ways to unapply migrations in django. In this article you will know about how you can change you models as per requirement of your application. In this article we will teach you to write the views in django.Views are the heart of the Django applications. They are responsible for the HTTP requests and HTTP responses. In between they perform some activities like database operations, rendering HTML templates, etc.. 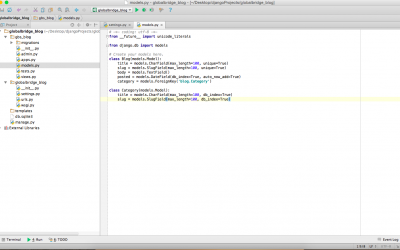 In this article you will learn in detail the Django code Structure and features. You will learn about Django URLs, MVC pattern and Templates. In this Tutorial you are going to learn about Django which is python framework, we will cover basics of django in detail and then we will develop django Application. In This tutorial we will guide you to the step by step blog development in Django, at this tep we are assuming that you have covered the previous chapters about Django setup. 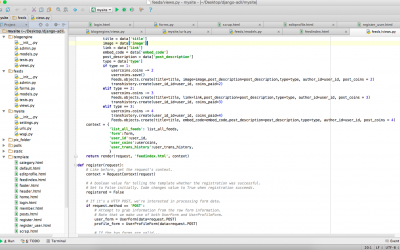 This article will Teach you that how can you Write your First application in Django. 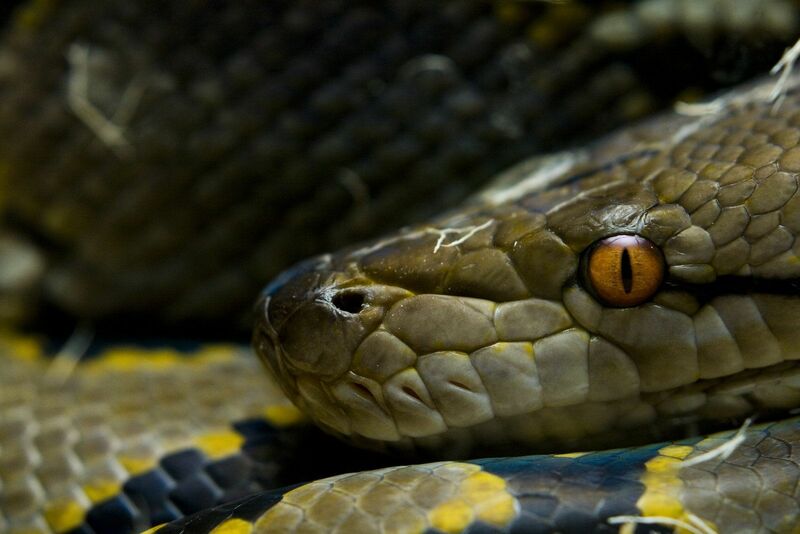 First you will need to setup Python/django you can read article How to Setup Django/python. After that Follow the steps below. This article will guide you to how you can setup Python django. This article also explain how you can Setup Python Environments, Virtual Environment , Installing pip , Setup Django project and run ,By Follow easy Steps. Normally configuring HTTPs properly on web project is a headache, we need lots of code on different places or need to handle through different tools. 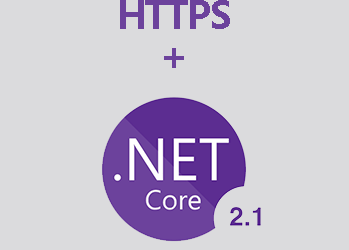 But in Asp.net Core (2.0 or higher) its super easy to configure. In fact, we don’t have to configure its already there we just need to understand. This article will guide you to how you can setup PHP version in IIS Manager. This article also explain how you can update your Php version from previous version or you can degrade the php version. 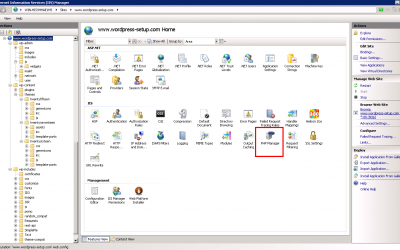 This article will guide you to how you can setup PHP in IIS Manager. This article will guide you to how you can install or setup wordpress on IIS Manager windows based server. Wordpress can be installed using PHP, IIS (internet information services) Manager , Mysql (phpmyadmin or MySQL Workbench ) database.